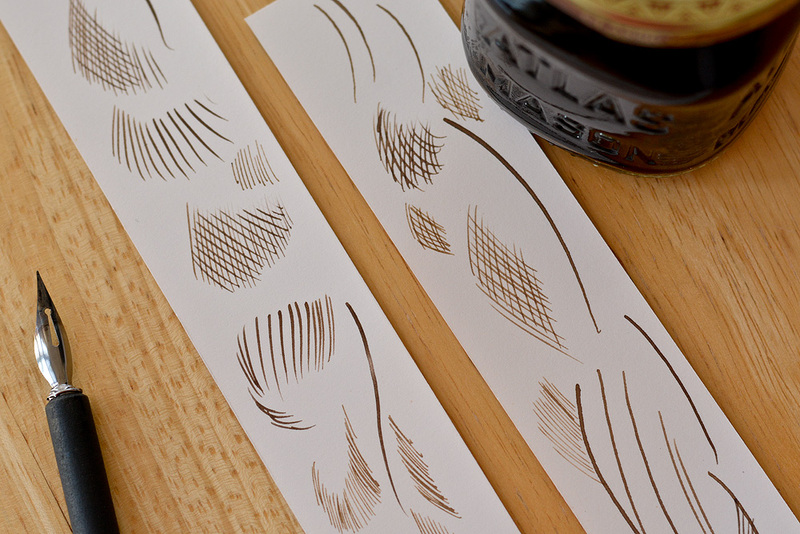 Walnut ink has a beautiful warmth and timeless appeal. To make your own ink, follow these simple steps below. Step 1: Find a Black Walnut tree and collect about a dozen walnuts. The green hulls that encase the nuts are what you’ll be using to make the ink. They have a lovely fragrance when fresh off the tree. 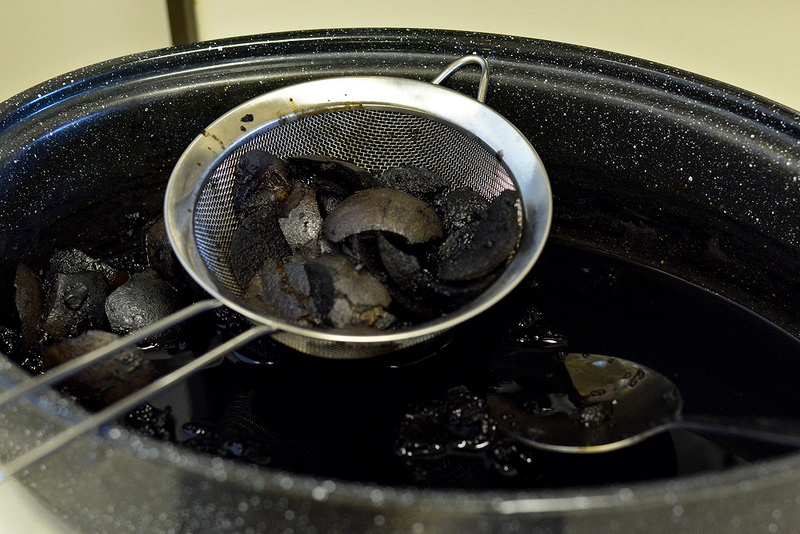 Wait until the skin starts to blacken before moving onto the next steps. Step 2: The hulls are a bit tough...use a knife to slice through them like you would an apple. Gloves are a must as the fluids will stain your hands. The walnuts are not part of the ink making process, so enjoy them or share with the squirrels. Step 3: Put all the pieces into an old pot and fill with enough water to cover. Bring to a gentle boil, then turn down the heat to low. Simmer for 3 hours, stirring occasionally. 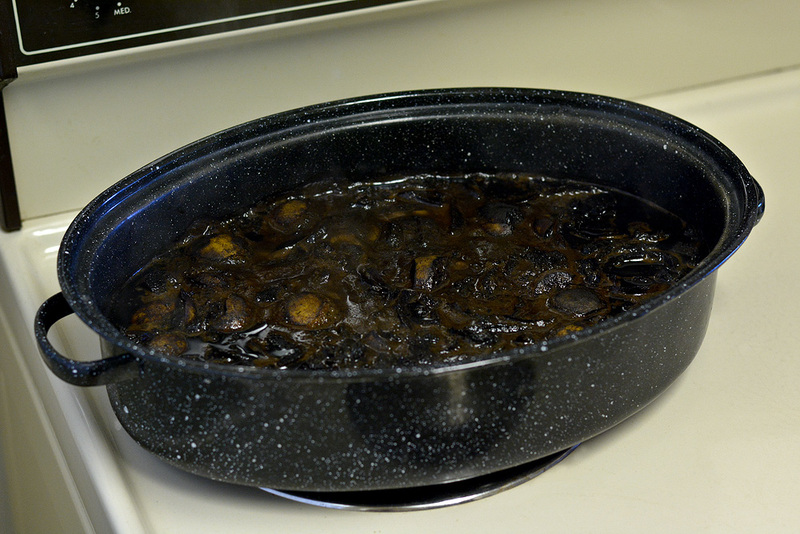 You can keep them cooking for longer to concentrate the liquid, but I found it was nice and dark after several hours. Step 4: Separate the large chunks with a fine metal sieve and strain the remaining fluid through an old cotton tea towel or t-shirt into a wide brimmed container. Afterwards, transfer the ink into a clean glass jar and you’re done! The ink has a thinner consistency than store bought drawing inks, but it looks wonderful and I had no trouble sketching this Oak leaf with my dip pen. I also dipped a Q-tip into the ink and spread it around like drawing with a felt marker, again, without any problems. If you prefer a more viscous ink, art shops sell bottles of Gum Arabic which might work as a thickening agent, though I’ve not tried it myself. The gum is a made from the sap of Acacia trees and is used as a binder in watercolour paints. I’ve come across ink recipes that call for adding rubbing alcohol or vinegar as a preservative, but you should be fine using a small jar within a year while keeping it stored someplace dark and cool. I’d caution against vinegar since it’s acidic and may affect the longevity of the paper. Online recipes also talk about darkening the ink by dropping pieces of rusty iron into the bottle, but I think it’s perfect just the way it is. Have fun making your ink and don’t forget the gloves!